Friday morning I had a workshop, it went kinda faster than expected, considering the last session was dragging a bit. Not sure if I skipped a few things. During the break, I was mindfully being aware of what I ate. Remembering last time I ate and ran at night, I felt a bit bloated, and was having side stitches during my run. Looked up again a scishow video on side stitches. Its possible that either my stomache wasn’t used to running with food anymore, or there is too much fibre. My fibre mostly coming from the juice my wife made. I don’t think that is the culprit. At night had a swim class, this time I didn’t forget to take a selfie at the end of the class. Saw a fee triathletes with some ironman finishers training again at the pool, but this time they trained at the lap pool. Then I went out on a run, but kept in mind the foot pain I had last time. It was either due to factors such as cold night mixed in with my wet shorts from swimming, and the swimming itself, (not much of a swim, mostly being immersed while teaching), causing the muscles and tendons to be tight and cold, and/or my running was too fast to soon, considering I haven’t been frequently running as I used to. So I went at a very relaxed pace of 8 mins/km. 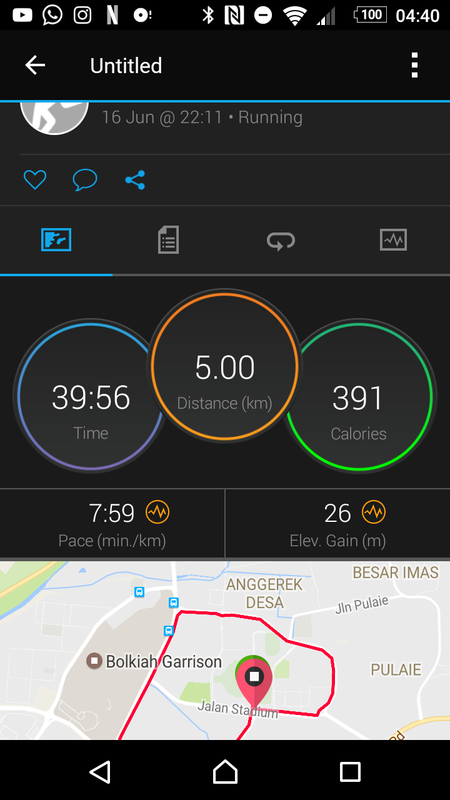 It was tempting to run at a faster pace whenever there were other people around, either them passing me by, or when crossing paths, but my slightly bloated stomache reminded me to slow down (apparently I still ate or drank a bit too much). but at least the side stitches was only at the beginning. And the foot pain was almost negligible. Ended the run with a significantly long stretching session targeting my back muscles, hamstring and calves, mostly lunges and the downward facing dog pose. And a bit of stepping on a low ledge, pressing on the middle of my soles. Its what I used to do to fix my plantar fasciitis a few years back. Hopefully at this early stage I can stave off further injuries with stretches. Something I need to remind myself to do more at this age. Posted on 2017/06/17, in Diet and Nutrition, Running, Swimming. Bookmark the permalink. Leave a comment.